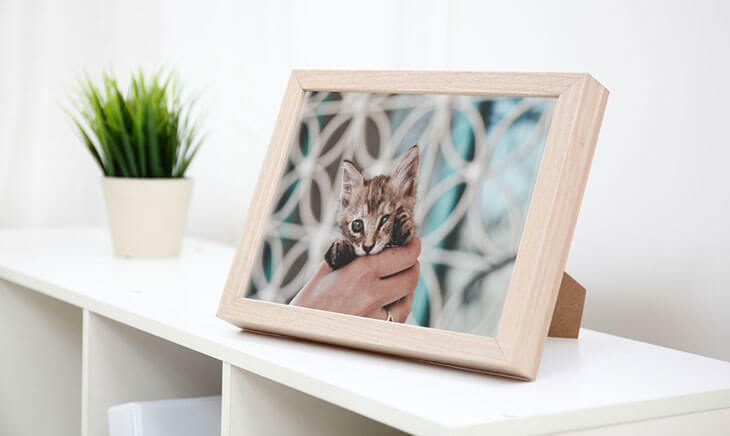 Our print & frame combos take the hassle out of getting your pictures printed and framed. Choose your frame, upload your photo and collect in-store - simple! EXCLUSIVITY At Camera Centre we have an exclusive range of high quality picture frames. With over 3000 frames regularly in stock, we're always able to fulfil demand. Our experts digitally balance each image before printing onto professional quality paper. Your print is then framed by hand in the exclusive picture frame you choose at the time of order. The glass is then polished ready for display. Your framed image then goes through a final quality control check before being packaged for collection/delivery. We have a large selection of frame sizes available including square format frames ideal for Instagram pictures. Order online or in-store in minutes. Allow 3 working days for production (enquire for urgent orders). For orders placed online, we'll notify you by email when the order has been received and completed. Add sales@thecameracentre.net to your safe-senders list. Get directions to our store and visit us today!